From modest beginnings the Wallenberg sphere had grown to employ 500 000 people in a number of companies with a total turnover of 125 mrd SEK, when Markus Wallenberg Junior died in 1982. The Wallenbergs have been playing an important role in Swedish industry, including many of the most successful Swedish companies with extensive international operations. When the Wallenberg family purchased shares of companies it was not a passive investment but it also meant personal commitment. Not only money was invested but also the personal resources of the Wallenbergs. The Wallenbergs made a determined intervention into the operations of the companies whose performance was not considered adequate. However, they also contributed positively to the performance of the companies belonging to their group during periods of reasonably good performance to guarantee that performance in the future. The importance of carrying the owner’s responsibility has long traditions in the Wallenberg family. André Oscar Wallenberg emphasized the social responsibility that results from being involved in industrial activity to his son Marcus in the letters that he wrote to him. However, Marcus Wallenberg Senior later on became critical of his father for not having revitalized the industrial firms when this was necessary. During his career Markus Wallenberg Senior himself became a specialist in revitalizing companies where the family was playing a role. Markus Wallenberg Senior emphasized the importance of finding good managers for companies that were experiencing problems. He developed a unique skill in finding creative solutions for: finding and attracting talented managers matching the management resources with the demands set by the business situation giving advice and any other support needed to the selected manager. Marcus Wallenberg Senior spent much of his time restructuring companies that were having problems due to the decline of their business ideas. 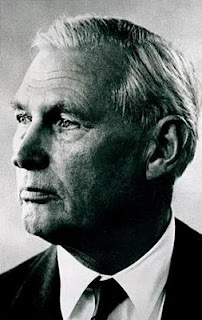 He made clear demands on general managers of the companies in the Wallenberg Group and those who did not meet the requirements were personally dismissed by him. The number of key executives that he dismissed during his career is quite large. In fact he was quite critical of his father who did not make changes in incompetent management structures. Markus Wallenberg Senior was very much aware of his role as the creator of corporate values and norms. According to him, those who are not performing well should be dismissed not only because they are not worth their salary, but also because if they are allowed to remain in the company, the others in the firm do not find it worthwhile to do an excellent job. Marcus Wallenberg Senior’s functioning in the ownership role was not only evident in companies whose business idea had started to decline. On the contrary, Marcus Wallenberg Senior was also active in creating new businesses based on new technologies. He played a key role, for example, in developing businesses in the new diesel engine and telephone technologies. He did not limit his role to financing but also to creating markets and developing international business opportunities for the new technologies. In doing so he actually determined to a large extent the future mission and role of these companies. Before Marcus Wallenberg Junior took over from his father he was carefully trained both by his father and by a number of people with whom he worked during a period when he was sent to several foreign countries for a traineeship. From his father he inherited a sense of responsibility for the companies in the sphere. His basic values were strikingly similar to those of his father’s. He clearly understood that if an industrial manager fails, this catastrophic consequences for a great number of people. He very strongly emphasized the responsibility that the company has to its employees and to society as a whole. The person who has the ultimate responsibility for a company must make sure that the management resources are adequate for the continuous development of the firm. If this is not the case, the owners must act. Marcus Wallenberg Junior had a very clear idea of the implications of being responsible for the fate of a company as an owner. He believed, for example, that if a manager fails, it is not the manager's fault, but the fault of the person who appointed him. This clearly indicates how Marcus Wallenberg Junior felt that the owners have the ultimate responsibility for everything that happens of does not happen in the company. It is the owner who takes the final decision in the most fundamental issues. A difficult test of Marcus Wallenberg Junior's ability to carry the owner's responsibility came in the late 1960's when it became evident that the family bank was unable to cope with changing environmental demands. Revolutionary new solutions were needed to deal with the new situation. Despite the many difficulties and conflicts involved he was the driving force behind the merging of the family bank with Skandinavian Banken in 1972 to quarantee the vitality of the bank in the future. The merger was, in a sense, a "crime" against old family traditions but a necessary if the vitality of the bank was to be quaranteed. 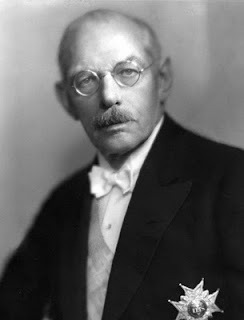 Marcus Wallenberg Junior was able to function as the carrier of owners' responsibility even if it meant a bitter conflict with his brother Jacob. By redefining the company mission and role he created a new basis for the company's growth. When we take a look at the development of the Wallenberg sphere during this century we can observe that there has always been an active carrier of owners' responsibility. It is also important to realize that the holder of this position has had clear incentives to make the ownership role work. The family tradition has placed very tough demands on the carrier of owners' responsibility. The traditions were to be respected and were carefully indoctrinated in the succeeding generation. It was not possible for the new key actor of the following generation to withdraw from the active bearing of owners' responsibility. Both Marcus Wallenberg Senior and Junior have emphasized the heavy burden that was put on their shoulders. It is interesting to note that in the history of capitalistic families, this kind of burden of ownership has sometimes been even too heavy for a representative of the next generation to bear. Furthermore, an additional incentive to play an active ownership role was, naturally, the substantial financial involvements. The Wallenbergs not only had the incentives to function as the carriers of owners' responsibility, but also the competence. Marcus Wallenberg Senior and Junior had extensive experience from acting as carriers of owners' responsibility in a great number of companies which enabled them to become specialists in, for example, making turnarounds. They became "company doctors". Both of them were put in very demanding situations at an early age and they had to mature fast. Both received extensive training from their fathers. Furthermore, Marcus Wallenberg Junior went through a training program (carefully worked out by his father) which included extensive travel abroad. This was combined with a formal business education. Furthermore, an important part of the competence of Wallenbergs was their extensive contacts both in Sweden and internationally. However, it is important to note that the Wallenbergs not only had the incentives and competence needed. They also had the power to undertake the necessary, often unpleasant steps to save companies or to build new businesses. The power position was partly based on ownership, and partly on other types of financial interests and frequently exercised with own involvement on the board. However, it should not be forgotten that their personal charisma, experience and good prior results also were important source of power in difficult situations. Jyrki Veranen (1987, 102-109) Ownership Function and the Performance of the Firm: A Study of the Renewal Processes of the Firm. Perjantaina Helsingissä pidettiin korkeatasoinen seminaari, jonka primus motor oli edesmennyt Pentti Kouri. Kahdeksankymmentäluvun alkupuolella syntyneenä kuulun ikäluokkaan, jolla ei ole hänestä omia muistikuvia. Kuten varmasti monelle ikäluokkani edustajalle Kourin nimi tuo mieleen Kouri-kaupat, jotka sen tarkemmin kyseisiä kauppoja ja sen taustoja tietämättä herättää negatiivisen mielikuvan. Kiinnostuin lukemani lehtijutun perusteella kyseisestä henkilöstä ja halusin selvittää tarkemmin, kuka oli Pentti Kouri. Google-haku kyseisestä henkilöstä tuotti varsin ristiriitaisen kuvan. Tämä haku itse asiassa osoitti yhden keskeisen piirteen historiastamme: ihmisestä jää jälkipolville helposti sellainen muistikuva kuin kyseistä henkilöä käsittelevä mediakirjoittelu on aikanaan ollut. Se onko tämä kirjoittelu ollut kuinka todenperäistä, yksipuolista ja tarkoituksenhakuista ei myöhemmässä vaiheessa käy helposti ilmi. Sanavalinnoilla ja esitystavoilla voidaan voimakkaastikin ohjata sitä, mitä asiasta lopulta muistetaan. KOP:n ja SYP:n kauppojen "brändääminen" Kouri-kaupoiksi on tästä yksi esimerkki. "Historia on voittajien kirjoittamaa" ja erityisesti Google-aikakaudella ihmisestä jälkipolville jäävä mielikuva muodostuu ensisijaisesti verkkoon jääneen jäljen perusteella. Tämä korostaa median ja ennen kaikkea verkkomedian roolia henkilöhistorian kirjoittamisessa. Useille henkilöille tämä käsittely ei tee kunniaa vaan tarvittaisiin syvällisempää historian tutkimusta ja monipuolisia näkemyksiä, jotta henkilöstä voitaisiin muodostaa paremmin totuutta vastaava kokonaiskuva. Oli Pentti Kourista henkilönä mitä mieltä tahansa, kukaan ei voi kiistää, etteikö miehen aikaansaannokset olleet Suomen mittakaavassa hyvin mittavia. Ohessa on pintapuolisen tarkastelun perusteella poimittuna muutamia perusfaktoja miehen elämästä. Harvalla suomalaisella on esittää yhtä vakuuttava ansioluettelo. Pentti Kouri (1949-2009) oli suomalainen taloustieteilijä ja pääomasijoittaja. Hän oli RUK:n kurssin 157 Ilkka oppilaskunnan hallituksen puheenjohtaja. Työskenteli nuorena maisterina Kansainvälisessä valuuttarahastossa. Kehitti kansainvälisiin valuuttaliikkeisiin liittyvän Kouri-Porter-mallin yhdessä Michael Porterin kanssa. Suoritti taloustieteen tohtorin tutkinnon MIT:sta 1974. Toimi taloustieteen professorina Stanfordin, Yalen, Helsingin ja New Yorkin yliopistoissa. Oli kansainvälisesti Suomen tunnetuin taloustieteilijä. Kuului George Sorosin tuttavapiiriin ja hoiti hänen sijoituksiaan Suomessa. Oli mukana järjestelemässä Kansallis-Osake-Pankin ja Pohjolan rahoilla Suomen Yhdyspankin nurkanvaltausyritystä, joka kuitenkin epäonnistui. Toimi hakukone Hakian perustana, rahoittana ja hallituksen puheenjohtajana. Keräsi suurena taiteenystävänä mittavan taidekokoelman, joka nykyisin on Kiasman hallussa. Löysin arkistosta Helsingin Sanomien tekemän kiinnostavan juttusarjan, jossa käsiteltiin Suomen epäonnistuneimpia yrityskauppoja. Juttusarjan idea oli havainnossa, jonka mukaan valtaosa yrityskaupoista epäonnistuu. Epäonnistuminen näkyy siinä, että yrityskauppa ei tuota yrityksen omistajille lisäarvoa vaan päinvastoin tuhoaa omistaja-arvoa. Yksi plus yksi ei ole kaksi vaan näissä tapauksissa valitettavasti paljon vähemmän. Toisaalta yrityskaupassa on aina kaksi osapuolta ja toisen tappio voi olla toisen voitto. Juttusarjassa asioita tarkasteltiin sinivalkoisin silmälasein. Jälkikäteen on helppo viisastella ja osoittaa sormea epäonnistuneille yrityskaupoille. Yrityskauppatilanteissa tehdään aina oletuksia tulevaisuuden kehityksestä ja tältä pohjalta päätöksiä sekä rationaalisin että emotionaalisin perustein. Kristallipalloa ei kenelläkään ole käytössä, joten epävarmuus on keskeinen osa yrityskauppatilanteita. Toinen keskeinen elementti on tiedon epäsymmetria. Neuvottelupöydässä tieto ei jakaudu tasapuolisesti ostajan ja myyjän välillä ja kaikkea kauppaan vaikuttavaa tietoa ei yksinkertaisesti ole käytössä. Tiedon määrää lisäämällä voidaan pienentää epäonnistumisen riskiä tiettyyn pisteeseen asti, mutta tieto ei koskaan takaa toivottua lopputulosta. Todennäköiseltäkin näyttävä skenaario voi jäädä toteutumatta yllättävän pikkuseikan takia. Näissä olosuhteissa yrityksen johdon on vain kyettävä tekemään päätöksiä. Jälkeenpäin voidaan sitten arvioida, osoittautuivatko päätökset yrityksen kannalta nerokkaiksi valloituksiksi tai tuhoavaksi tappioksi. Helsingin Sanomien juttusarjaan liittyi myös lukijaäänestys Suomen epäonnistuneimmasta yrityskaupasta. Äänestyksen perusteella synkimmäksi sivuksi Suomen yrityskauppahistoriassa äänestettiin kauppa, jossa Stora Enso osti amerikkalaisen metsäteollisuusyhtiön Consolidated Papersin helmikuussa 2000 ylihintaan ja myi yhtiön 2007 halvalla. Äänestystulokseen vaikutti todennäköisesti ajankohta. Itselleni juttusarjassa esitellyistä tapauksista mielenkiintoisin on case Tampella. Olisi kiinnostavaa jossain vaiheessa tutkia, miten Suomen merkittävin teollisuuskonserni onnistuttiin ajamaan monen vaiheen kautta omistajien toimesta niin pahasti karille? Ehkä tapaus Tampella on synkimmät sivut suomalaisen omistajuuden historiassa. Ohessa on Helsingin Sanomien juttusarjan esittelemät tapaukset. Osuuskunta Ekaan kuuluva vakuutusyhtiö Kansa osti vuonna 1980 kolmanneksen amerikkalaisesta rahoitusalan yhtiöryppäästä Clarendonista, joka omisti muun muassa vakuutusyhtiöitä. Kansa sai syliinsä ryhmän kaksi vakuutusyhtiötä vuoden 1987 pörssiromahduksen jälkeen. Suomalaisyhtiö oli taannut Clarendonin bisneksiä, ja se joutui takaajana vastuuseen, kun ryhmä alkoi upota. Kansa järjesti Clarendonille käteistä ostamalla vakuutusyhtiöt. Takausvastuusta alkanut operaatio maksoi Kansalle miljardi silloista markkaa. Eka rahoitti tästä 800 miljoonaa markkaa Kansan osakepääoman korotuksena. Korotus kuppasi Ekaa parahiksi ennen lamaa. Clarendon-kauppa oli merkittävä osatekijä siinä, että Eka joutui yrityssaneeraukseen, Vahinko-Kansa myytiin pakkoraossa Sammolle ja Henki- ja Eläke-Kansa menivät konkurssiin. Säästöpankkien Keskus-Osake-Pankki SKOP osti 1980-luvun puolivälissä kilvan SYP:n kanssa teollisuusyhtiö Tampellan osakkeita. Maaliskuussa 1987 SYP myi haalimansa 2,4 miljoonaa Tampellan osaketta SKOP:lle ja teki kaupalla 400 miljoonan markan voiton. Kalliissa kaupassa SKOP otti vastuulleen myös kaikki Tampellan velat. Tampella oli kasinotalouden musta pekka, josta piti päästä nopeasti eroon. SKOP kaavailikin pilkkovansa yhtiön ja myyvänsä sen paloina eteenpäin. Suunnitelma kuitenkin vesittyi, kun SKOP:n pääjohtaja Matti Ali-Melkkilä lupasi kaupan julkistustilaisuudessa, että SKOP ei pilko Tampellaa ja "pitää sen ainakin 20 vuotta". SKOP ryhtyi rakentamaan Tampellasta oman teollisuusryhmänsä kantayhtiötä. Suomeen iski lama, ja SKOP kaatui. Pelastaakseen Suomen pankkijärjestelmän Suomen Pankki otti SKOP:n haltuunsa. Samalla keskuspankista tuli myös Tampellan pääomistaja. Valtio pilkkoi Tampellan ja myi osat eteenpäin. Suomen suurin pankki, SYP:n ja KOP:n fuusiossa syntynyt Merita myytiin 1997 ruotsalaiselle Nordbankenille. Kauppa tehtiin osakevaihdolla. Nordbankenin omistajat saivat yhdistyneen pankin omistavasta holding-yhtiöstä 60 prosenttia, mutta äänivalta jaettiin tasan. "Meritan pääjohtaja Vesa Vainio neuvotteli loistodiilin", suomalaisissa tiedotusvälineissä iloittiin, sillä sen hetkisillä osakekursseilla omistuksen olisi pitänyt jakaantua prosenttiosuuksilla 63–37. Loistodiilin voi nähdä myös niin, että Nordbanken maksoi mitättömän pienen preemion Meritasta. Nordbanken sai Meritan kautta suvereenin aseman Suomen pankkimarkkinoilla. Markkinaosuus Suomen vähittäispankkitoiminnasta oli 40 prosenttia ja yritysrahoituksesta 60 prosenttia. Pankkikriisin jälkihoidon ja kovan saneerauskuurin jäljiltä Meritan kannattavuus oli petraantumassa huimaa vauhtia. Nordbanken sen sijaan oli Ruotsin pankkikentän kakkosketjulainen – yksityisasiakkaisiin ja pk-yrittäjiin keskittynyt postipankki, jolla oli olematon asema yritysrahoituksessa. Kannattavuutensa se oli toki saanut trimmattua hyväksi, lähinnä siksi, että Ruotsin pankkikriisissä valtio puhdisti sen tasetta riskeistä 40 miljardin kruunun pankkituella. Vaikka Meritan ja Nordbankenin yhdistymistä mainostettiin tasavertaiseksi fuusioksi, sitä se ei koskaan ollut. Kakkosketjulainen Nordbanken osti Meritan. Yhdistyneen yhtiön kieleksi tuli ruotsi ja pääkonttori siirrettiin Tukholmaan. Sittemmin Nordeaksi nimensä muuttanut yhtiö laajentui muuallekin Pohjoismaihin, mutta edelleen vähittäispankkitoiminta Suomessa on kirkkaasti yhtiön kannattavin osa. Pohjoismaisen pankkijätin rakentaminen on jälkikäteen osoittautunut hyväksi liikkeeksi, mutta Merita myytiin luvattoman halvalla. Jos kauppa olisi tehty vuotta paria myöhemmin, vaihtosuhde olisi voinut olla päinvastoin 60–40 Meritan hyväksi. Metsäyhtiö Stora Enso myi tammikuussa 2000 energiayhtiö Fortumille sähköntuotantokapasiteettia 1,8 miljardilla eurolla. Fortum sai Ruotsista 42 ja Suomesta viisi vesivoimalaa ja lisäksi pienet osuudet kahdesta Ruotsin itärannikolla sijaitsevasta ydinvoimalasta. Kaupattu 1500 megawattia vastaa noin kahden ydinvoimalan kapasiteettia. Stora Enso luopui voimaloista, koska ne eivät kuuluneet metsäyhtiön ydintoimintoihin. Fortum taas nousi ostoilla Pohjoismaiden toiseksi suurimmaksi sähköntuottajaksi. Stora Enso myi voimalat halvalla. Sähkön hinta on 2000-luvun aikana moninkertaistunut varsinkin sen jälkeen, kun EU käynnisti päästökaupan. Fortum voi ottaa vesi- ja ydinvoimalla tuotetusta päästöttömästä sähköstä yhtä kovan hinnan kuin päästöjä tuottavasta kivihiilisähköstä. Fortum on tainnut saada kauppahinnan jo nyt voittoina takaisin, sillä vanhan vesivoiman tuotantokustannukset ovat hyvin alhaiset. George W. Meadilla, 72, oli hymy herkässä helmikuussa 2000. Helsinkiläisessä hotellissa pidettiin tiedotustilaisuus, jossa kerrottiin, että Stora Enso on noussut maailman suurimmaksi paperi- ja kartonkiyhtiöksi ostamalla Meadin firman, amerikkalaisen metsäteollisuusyhtiön Consolidated Papersin. Hallituksen puheenjohtaja sukuineen kuittasi 36 prosenttia yhtiön kauppahinnasta. Hinta oli 29 miljardia markkaa. Se ylitti 70 prosentilla Consolidatedin silloisen osakekurssin. Jopa Stora Enson pääjohtaja Jukka Härmälä myönsi hinnan tuntuvan "verrattain korkealta". Markkinoilla ostajayhtiön kurssin rojahti 15 prosenttia. Stora Enson uusi toimitusjohtaja Jouko Karvinen tuskastui nopeasti Consolidatedin kehnoon kannattavuuteen ja alan ankeisiin näkymiin USA:ssa ja myi Consolidatedin viime syksynä pääomasijoitusyhtiö Cerberukselle 2,1 miljardilla. Kun yhtiöstä maksettiin 4,9 miljardia ja siitä saatiin kahdeksan vuoden mittaan 800 miljoonan euron kassavirta, tappioksi jäi kaksi miljardia euroa eli yli 22 miljoonaa kuukaudessa koko omistusajalle jyvitettynä. Tämä laskelma, yksi monista, on Stora Enson oma. Kaupan surkeuden tunnusti keväällä myös Stora Enson hallituksen puheenjohtaja Claes Dahlbäck. "Tämä oli huonoin päätös, jonka tekemiseen olen osallistunut", ruotsalainen sanoi yhtiökokouksessa. On väitetty, että tappio olisi muotoutunut olennaisesti pienemmäksi, ellei Consolidatedin myynnissä olisi pidetty niin kovaa kiirettä. Paperin hinnat USA:ssa ovat viime syksystä vahvasti nousseet ja Consolidatedin kannattavuus parantunut. Osuuskunta Metsäliiton pörssinoteerattu tytäryhtiö Metsä-Serla (nykyisin M-real) päätti UPM:n ja Stora Enson esimerkin mukaan lähteä vuonna 2000 maailmanvalloitukseen yritysostoilla. Ensin se osti kesäkuussa 2000 ruotsalaisen hienopaperiyhtiön MoDon 14 miljardilla markalla eli 2,3 miljardilla eurolla. Marraskuussa yhtiö osti Saksasta toisen hienopaperiyhtiön Zandersin 250 miljoonalla eurolla. Erikoista kaupoissa oli se, että Metsä Serlan piti strategiansa mukaan keskittyä aikakauslehtipaperiin, mutta silti se osti hienopaperiyhtiöitä. Etenkin MoDo-kauppa oli M-realin kokoon nähden erittäin iso. Yhtiö kaavaili rahoittavansa osan kaupasta myymällä vessapaperiyhtiönsä Metsä Tissuen ruotsalaiselle SCA:lle, mutta EU:n kilpailuviranomaiset estivät myynnin. Kaupat runtelivat M-realin taseen, ja yhtiö on tehnyt 2000-luvulla satojen miljoonien eurojen tappiot. Toinen toistaan seuraavista säästöohjelmista huolimatta yhtiötä ei ole saatu kuntoon. M-real olisi ilmeisesti mennyt jo nurin, jos sen pääomistaja Metsäliitto ei olisi antanut hätäapua. M-realin luottoluokitus on kuralla, ja lainojen riskilisät ovat kohonneet Suomen ennätystasolle. Todelliseen testiin yhtiö joutuu 2009 ja 2010, kun sen isot lainat erääntyvät. Vakuutusyhtiö Pohjola osti kesällä 2001 pankkiiriliike Conventumin 270 miljoonalla eurolla. Kaupasta neuvottelivat Pohjolan suuromistajan, Ilmarisen sijoitusjohtaja Eero Heliövaara ja Conventumin pääomistaja Peter Fagernäs. Kaupan myötä Ilmarisen Eero Heliövaara nousi Pohjolan toimitusjohtajaksi ja Peter Fagernäs hallituksen puheenjohtajaksi. Myöhemmin Pohjola havaitsi maksaneensa Conventumista tolkuttomasti ylihintaa. Alaskirjausten perusteella pankkiiriliikkeestä oli maksettu jopa 165 miljoonaa euroa liikaa. Ruotsalainen teleoperaattori Telia osti suomalaisen Soneran maaliskuussa 2002. Osakevaihdolla tehdyssä kaupassa Soneran omistajat saivat 36 prosenttia yhdistyneen yhtiön osakkeista, Telian omistajat loput 64 prosenttia. Sonera oli ajautunut kriisiin, koska yhtiö kesällä 2000 oli ottanut liian ison riskin ja maksanut yli neljä miljardia euroa kolmannen sukupolven kännykkäluvista Saksassa ja Italiassa. Vuotta myöhemmin Suomen valtio joutui tulemaan hätiin. Yhtiön pelastamiseksi järjestettiin syksyllä 2001 miljardin euron osakeanti, jolla lyhennettiin velkoja niin, että yhtiö kelpasi ostajille. Annin aikainen liikenne- ja viestintäministeri Olli-Pekka Heinonen (kok) lupasi, että Soneraan sijoitettu markka tulee muutamassa vuodessa eurona takaisin. Lupaus ei ole ainakaan vielä toteutunut, sillä tuolloin Soneraan sijoitetun markan arvo on tätä nykyä vajaat 50 senttiä. Keväällä 2002 korostettiin, että kyse on kahden tasaveroisen kumppanin liitosta, vaikka pääkonttori meni Tukholmaan ja toimitusjohtaja tuli Teliasta. Matkan varrella tuli selväksi, että yritystä johdetaan Telian virkamieskulttuurin hengessä. Suomen valtio halusi eroon Sonerasta, koska yhtiöstä oli tullut poliitikoille rasite. Yhtiö myytiin ensimmäisellä sopivalla hetkellä. Hitaammin kiiruhtamalla Sonera olisi todennäköisesti päässyt jaloilleen ja omistajat olisivat saaneet osakkeistaan paremman hinnan. Suomen valtio myi toukokuussa 2002 vajaan kolmanneksen osuutensa Partekista hissiyhtiö Koneelle, joka myöhemmin osti loputkin Partekin osakkeet. Velat mukaan lukien Kone maksoi konepajayhtiöstä 1,6 miljardia euroa. Valtio-omistaja oli kyllästynyt Partekin toimivan johdon monimutkaisiin yrityskauppavirityksiin. Partek oli kevään aikana neuvotellut fuusioista sekä Wärtsilän että nosturiyhtiö KCI Konecranesin kanssa. Toimitusjohtaja Christoffer Taxellin järkytykseksi valtio myi osakkeensa pika-aikataululla Koneelle. Pääjohtaja Antti Herlin vakuutti, ettei Koneella "ole minkäänlaista aikomusta pilkkoa Partekia osiin". Jo vuoden 2002 lopussa Kone myi Partekin kalkkikivibisnekset. Seuraavana syksynä myyntiin menivät Valmet-traktorit sekä metsäkoneet. Kone sai puolessatoista vuodessa myymistään Partekin osista reilut miljardi euroa. Jäljelle jääneet Hiabin ja Kalmarin Kone laittoi uuden, lastinkäsittelylaitteita valmistavan Carcotec-yhtiön perustaksi. Yhtiön pörssiarvo on 1,4 miljardia. "Veronmaksajien näkökulmasta valtio teki ihan onnistuneen kaupan", myynnin aikana kauppa- ja teollisuusministerinä toiminut Sinikka Mönkäre (sd) arvioi syksyllä 2004. Teräsyhtiö Outokumpu on syklinen yhtiö, mikä tarkoittaa sitä, että sen osakkeen arvoon vaikuttavat suhdanteiden muutokset roimasti. Sijoittajan kannalta sykliseen osakkeeseen sijoittaminen on haastavaa, sillä usein on hankala tietää, milloin sykli on alimmillaan ja milloin huipussaan. Yksi hyvä keino tunnistaa syklin vaihe on seurata Outokummun yrityskauppoja. Viime vuosien perusteella voisi sanoa, että aina kun Outokumpu myy jotain, kyseisen myytävän yhtiön toimiala on suhdanteen pohjamudissa. Talouselämä-lehti kokosi pari viikkoa sitten Outokummun yritysmyynnit 2000-luvulta. Vuonna 2006 Outokumpu listasi ja myi teknologiayksikkönsä Outotecin 610 miljoonalla eurolla. Nyt Outotecin markkina-arvo on 1,8 miljardia euroa. Vuonna 2005 Outokumpu myi muokatut kuparituotteet pääomasijoittaja Nordic Capitalille 599 miljoonalla. Outokumpu kirjasi kaupasta 220 miljoonan tappion. Vuonna 2002 Outokumpu myi Pyhäsalmen sinkki- ja kuparikaivoksen kanadalaisyhtiölle 82 miljoonalla. Seuraavana vuonna se myi sinkki- ja kuparisulattonsa ruotsalaiselle Bolidenille 600 miljoonalla eurolla. Pian tämän jälkeen sinkin ja kuparin hinnat kipusivat kaikkien aikojen ennätykseensä. Harjavallan nikkelitehtaan Outokumpu myi 180 miljoonalla eurolla vuonna 2000. Huippuhintaisen nikkelin myötä nikkelitehtaan liikevoitto 2000–2007 oli 593 miljoonaa euroa. Talvivaaran kaivoksen yhtiö myi entiselle työntekijälleen Pekka Perälle yhdellä eurolla 2003. Nyt Lontoon pörssiin listatun Talvivaaran markkina-arvo on 1,3 miljardia euroa. Nokia osti viime lokakuussa digitaalisia karttoja tekevän amerikkalaisen Navteq-yhtiön 5,7 miljardilla eurolla. Hinta on suurin suomalaisyrityksen kautta aikain maksama kauppahinta. Fortum puolestaan osti maaliskuussa kahdella miljardilla tukevan osuuden Länsi-Siperiassa toimivasta sähkötuotannon yhtiöstä. Nokian ja Fortumin ostojen järkevyydestä ei vielä voi sanoa yhtään mitään. Voi olla, että jompikumpi tai molemmat miljardikaupat kymmenen vuoden kuluttua päätyvät kehnoimpien yritysjärjestelyjen listoille – mutta yhtä lailla ne voivat nousta kymmenen onnistuneimman ostoksen joukkoon nerokkaina siirtoina, jotka veivät yhtiöt uusiin bisneksiin. Yritys sijoittajamarkkinoilla on Raija Kariolan, Hannu Angervuon ja Jaakko Niemelän kirjoittama teos pääomamarkkinoiden toiminnasta sekä sijoittajien ja yritysten välisestä kommunikaatiosta. Kirja on alan pitkänlinjan ammattilaisten kirjoittama, mikä näkyy teoksen tasossa. Kirja on kokonaisuudessaan suositeltavaa luettavaa aihepiiristä kiinnostuneille. Itselleni kirjan kiinnostavinta antia oli luku 7, joka käsittelee sijoittajamarkkinoiden erilaisia omistajatyyppejä ja omistajastrategioita. Koska luku liippaa niin läheltä omaa tutkimusaihettani, on seuraavassa talteen poimittuna varsin kattavat tiivistelmät kirjoittajien näkemyksistä heidän omin sanoin. Osakesijoittamisen perusteena on aina tuotto. Sijoittamiskohteen valintaan liittyy kuitenkin myös muita tekijöitä, jotka vaikuttavat sijoittamisen tavoitteisiin, aikajänteeseen ja kärsivällisyyteen. Kirjallisuudessa esiintyy erilaisia tyypittelyjä, joissa vertaillaan sijoittamisen strategioita ja näkökulmia (esim. 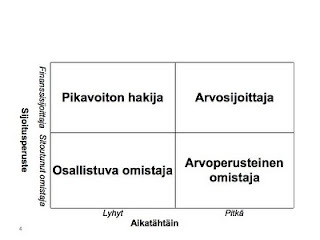 Olli-Pekka Lumijärvi: Pörssiyhtiöiden omistajien erilaiset strategiat, KPMG Consulting 2002). Useimmilla sijoittajilla on osakesijoittajana tietoinen strategiansa ja tavoitteensa. Sijoittajan on tarkoitus olla yrityksen omistajana sijoitusperusteensa mukaisesti pitemmän tai lyhyemmän ajan. Sijoituspääoman sitoutumisen aikajänne voi perustua vaikka päätökseen irrottautua tietyn tuoton saavuttamisen jälkeen tai nopean kaupankäynnin strategiaan, jossa tuotot kerätään kurssien jatkuvasta muutoksesta vilkkaalla kaupankäynnillä ja volyymilla. Toisaalta osakesijoitus voi olla säästöluonteinen ja perustua pitkän aikajänteen strategiaan. Yritysjohdon kannalta merkitystä on sillä, mihin sijoittajan kiinnostus kohdeyritystä kohtaan perustuu: haluaako hän olla aktiivinen yrityksen strategisiin valintoihin vaikuttava vallan käyttäjä vai tuottokeskeinen finanssisijoittaja, joka vaikuttaa vain välillisesti yrityksen päätöksentekoon äänestämällä jaloillaan, jos toiminta ei miellytä. Välttämättä kaikilla sijoittajilla ei ole varsinaista sijoitusstrategiaa. Osa sijoittajista on enemmänkin ajautunut omistajiksi esimerkiksi perittyään osakkeita tai saatuaan ne lahjoituksena tai yritysjärjestelyn kautta. Tällaisia voivat olla säätiöt, yritykset tai yksityishenkilöt. Passiivisina omistajina he ovat yritysjohdon kannalta vaivattomia, mutta jos tällaisen sijoittajan omistusosuus on merkittävä ja sijoittajan omistusstrategia äkkiä muuttuu aktiiviseksi omistajavaltaa käyttäväksi, yritysjohto voi kokea yllättäviä tilanteita. Sijoitusrahastojen julkistettu omistajapolitiikka on hyödyllinen paitsi rahastoon sijoittaville, myös sijoituskohteena olevien yritysten johdolle muun muassa silloin, kun yritys aikoo panostaa resursseja hankkeisiin, joiden on mahdollista kohdata joidenkin omistajien vastustusta. Yksityissijoittajan omistusstrategia voi olla sekä finanssilähtöinen että vallankäyttöön tähtäävä, ja sijoituksen aikajänne vaihtelee. Yksityissijoittajia enemmän yritysjohdon ajankäyttöön vaikuttavat instituutiosijoittajat, jotka hallinnoivat suurinta osaa sijoitettavasta pääomasta. Institutionaalinen finanssisijoittaja haluaa yrityksen johdolta tietoja ja tapaamisia varmistaakseen oikean ajankohdan sitoa ja vapauttaa hallinnoimaansa osakepääomaa. Finanssisijoittaja antaa liiketoimintavallan yritysjohdolle, mutta edellyttää sijoitukselleen tuottoa. Hän suhtautuu analyyttisesti ja rationaalisesti sijoitukseensa ja on vastuussa omille asiakkailleen tuottolupauksistaan. Sekä lyhyellä että pitkällä tähtäimellä sijoittavan finanssisijoittajan aikajänne on yrityksen kannalta katsottuna lyhyt ja tuottokeskeinen. Kun sijoittajat sanovat "pitkä tähtäin", he tarkoittavat aivan eri pituista aikaa kuin yritysjohto. Käsitteistö on muutenkin sijoittajilla ja yritysjohdolla hyvin erilainen; samat sanat tarkoittavat eri asioita. Yrityksen omistajarakenteella on yrityksen päätöksenteon kannalta suuri vaikutus. Kun omistajan valtaa käyttää selkeä pääomistaja, asioiden käsittelykäytännöt ovat hyvin erilaisia verrattuna tilanteeseen, jossa yrityksen omistus on erittäin hajaantunut. Kummassakin ääritapauksessa johdolla on yleensä selvä käsitys siitä, kuka valtaa käyttää. Merkittävän pääomistajan yrityksessä omistajan ääni ohjaa johdon toimintaa ja dominoi yleensä myös hallitustyöskentelyä. Mitä hajaantuneempaa omistus on, sitä merkittävämpi on hallituksen ja sen puheenjohtajan rooli ja toimintavapaus. Näiden omistustilanteen äärivaihtoehtojen välissä on monia valtavariaatioita, joissa on sekä vahvuuksia että heikkouksia. Kirjoittajat tarkastelevat teoksessaan omistajastrategioiden malleja mukaillen osakkeenomistajan asennoitumista sijoittamiseen kahden tekijän suhteen: sijoituksen aikajänteen ja sijoittamisen tärkeimmän perusteen. Tällä mallilla kirjoittajat luokittelevat sijoittajat neljään eri ryhmään: pikavoiton hakijoihin, arvosijoittajiin, osallistuviiin omistajiin ja arvoperusteisiin omistajiin. Lyhyellä tähtäimellä toimivilla finanssisijoittajilla voi olla merkitystä yrityksen osakevaihdon vauhdittajina. Yritysjohto turhautuu kuitenkin helposti finanssisijoittajaryhmän toiminnasta. Suurina institutionaalisina sijoittajina ne ovat tärkeitä yritykselle, ja johto panostaa aikaansa tapaamisiin, joskus lukuisia tunteja ja useita kertoja ennen kuin sijoittaja päättää sijoittaa osakkeeseen. Jos käväisy osakkeiden omistajana onkin lyhyt, johdon on vaikea ymmärtää, miksi. Joskus merkittävän sijoittajan menettäminen voi vaikuttaa myös yrityksen maineeseen, jos omistuksen muutos saa runsaasti julkisuutta esimerkiksi omistajan liputusvelvollisuuden tai median nostamana. Hyvän ammattisijoittajan maineessa olevan sijoittajan irrottautuminen voidaan tulkita samalla tavalla kuin arvopaperivälittäjän suositus "myy". Vastaavasti merkittävän, kansainvälisen, finanssilähtöisesti ajattelevan sijoittajan tuleminen yrityksen omistajaksi tulkitaan markkinoilla osoituksena siitä, että yritys on juuri nyt hyvä sijoituskohde. Näyttävät sijoittajien muutokset vaikuttavat siten markkinoilla olevien muiden sijoittajien ajatteluun samalla tavalla kuin yritysten johdon merkittävät omistusmuutokset. Markkinoiden ajattelu lähtee siitä, että yrityksen johto tietää ja merkittävät institutionaaliset sijoittajat voivat asemansa johdosta arvioida yrityksen tilanteen paremmin kuin muut. Reaktiot ovat sen mukaisia. Finanssisijoittajat pitävät useimmiten selkeän välimatkan yritykseen ja käyttävät valtaansa perinteisellä tavalla: myyvät tai ostavat osakkeensa kertomatta tai kommentoimatta yritykselle. Välimatka antaa finanssisijoittajalle erillisyyden sisäpiiritiedosta ja vapauden nopeisiin muutoksiin osakkeiden omistamisessa. Pitemmällä tähtäimellä toimiva finanssisijoittaja on arvosijoittaja, joka hakee tuottoa arvonnousuna tai vahvana osinkovirtana. Sijoittaminen perustuu rationaalisiin ja analyyttisiin päätöksiin. Arvosijoittajalla on kärsivällisyyttää odottaa arvon nousua yrityksen kehittymisen, kasvun ja rakenneratkaisujen myötä. Tällainen sijoittaja saattaa seurata yritystä useita vuosia, ensin harkitessaan sijoituksen tekemistä ja sittemmin odottaessaan arvonnousua. Johdon kannalta ammattimaisen arvosijoittajan kanssa käydyt keskustelut voivat parhaimmillaan olla hyvin antoisia ja antaa uusia ajatuksia. Haasteeksi voi kuitenkin muodostua se, että sijoittaja ei ole erityisen hyvin perillä toimialasta tai yrityksen toiminnasta. Taivata johto kykenee hyödyntämään keskustelut ajattelunsa rikastuttajana ja suodattamaan uudet ajatukset omien ja asiantuntijoidensa näkemysten kautta. Toisinaan arvosijoittaja käyttää omistajavaltaansa johdon tapaamisissa esittämällä kriittisiä kommentteja johdon strategisista linjauksista tai vaatimuksia tietyn suuntaisista toimenpiteistä. Vallankäytön keinona käytetään keskittymistä keskustelussa korostetusti johonkin erityiseen kysymykseen tai viljelemällä pehmeitä uhkakuvia ja määräaikoja: "Onko todella niin, että yrityksellä ei ole minkäänlaisia aikomuksia myydä tätä osaa liiketoiminnoistaan?" tai "Olen päättänyt antaa itselleni aikaa puoli vuotta seurata tilanteen muuttumista. Jos muutosta ei näy, aion myydä omistukseni yhtiöstä." tai "Mikäli strategia ei selkiydy, jätän yrityksen aktiivisen seurannan, enkä harkitse osakkeiden ostoa ennen kuin näen selvästi, mitkä ovat yrityksen todelliset tavoitteet." Osallistuvia ja liiketoimintaan vaikuttavia omistajia ovat esimerkiksi yritys, jolle omistus on strateginen sijoitus, tai entinen pääomistaja, joka haluaa edelleen olla mukana varmistamassa sijoituksensa kehittymistä. Suurimpana tai merkittävänä omistajana tällainen sijoittaja osallistuu yleensä hallituksen työskentelyyn sen jäsenenä tai puheenjohtajana. Hän testaa, haastaa ja sparraa kriittisesti johdon ajatuksia ja suunnitelmia. Hänellä on yleensä selkeä näkemys siitä, mihin yrityksen toimintaa tulee ohjata ja hän saattaa osallistua operatiivisen toiminnan päätöksentekoon johdon taustajäsenenä. Parhaimmillaan hän tuntee alaa ja liiketoimintaa hyvin ja on merkittävä tuki johdolle. Pahimmillaan hän on kyvytön riskinottoon ja haluton muutokseen ja jarruttaa yrityksen kehittymistä johdon kaavailemaan suuntaan. Hänen halunsa säilyttää määräysvalta saattaa estää esimerkiksi omistajarakenteen laajentamisen tai pääoman hankinnan markkinoilta. Pitkäjänteisin ja kärsivällisin sijoittajatyyppi on yritykseen tai toimialaan arvoperusteisesti sitoutunut sijoittaja, joka voi olla joko yrityksen suursijoittaja tai yhteisöomistaja, kuten säätiö tai yritys. Tällainen sijoittaja kokee jotain periaatteellista kiinnostusta yritystä tai toimialaa kohtaan. Intressi voi perustua aatteelliseen tai eettiseen näkökulmaan tai esimerkiksi yrittäjyyteen tai vanhaan omistajuuteen. Sitoutuneen omistajan lyhyt tähtäin voi olla pitempi kuin pitkällä tähtäimellä toimivan arvosijoittajan pitkä tähtäin. Sitoutuneen omistajan näkökulma voi olla yhteiskunnallinen tai tavoitteena saattaa olla pyrkiä vaikuttamaan talouselämään tai toimialaan. Tällaisia omistajia ovat esimerkiksi puhtaasti eettisin perustein sijoittavat rahastot tai idealistisin periaattein toimivat merkittävät yksityissijoittajat. Sitoutuneelle omistajalle oman sijoituksen arvon tai tuoton kasvattaminen ei ole välttämättä ensisijainen omistamisen peruste. Yrityksen yhteisövastuullisuuden periaatteet ovat tälle omistajatyypille läheisiä arvoja, ja hän asettaa johdolle paineita ottaa huomioon yrityksen toiminnassa omistajien lisäksi myös muut sidosryhmät. Vahva ja sitoutunut arvoperusteinen sijoittaja voi asettaa merkittävänä omistajana yrityksen johdon ristiriitaiseen asemaan odotuksillaan, etenkin jos muut merkittävät omistajat ovat arvon ja tuoton kasvattamiseen tähtääviä finanssi- ja arvosijoittajia. Yritysjohdon tilanne voi muodostua myös hyvin haasteelliseksi, jos merkittävä omistaja muuttaa yllättäen sijoitusstrategiaansa ja näkökulmaansa: entinen sitoutunut kehittäjäomistaja ottaa finanssisijoittajan strategian ja toimii johdon kannalta odottamattomalla tavalla. Se, mikä taho yrityksen päätäntävaltaa käytännössä käyttää -omistajat, hallitus vai johto - riippuu siitä, millainen on omistajarakenne ja omistajien keskinäinen omistussuhde. Valtaa käyttävä taho määrittelee yrityksen liiketoimintastrategian ja omistajastrategian. Rohkean kasvun vauhdittajana tai jarruna voi olla merkittävä omistusosuus. Myös pelkästään pitkäjänteiseen tai ainostaan lyhytjänteiseen omistajastrategiaan painottunut omistajakunta voi olla ongelma, sillä osakkeen vaihdon vilkkaus voi vinoutua omistajajakauman seurauksena. Näkyvän omistajan yrityksessä johdon on helpompi noudattaa omistajien odotuksia, kasvottoman omistajakunnan yrityksessä johdon toimintavapaus on suurempi. Johdon on hyvä muistaa, kenen valtaa se yrityksessä käyttää, mutta sijoittajamarkkinoiden tehtävänä ei ole johtaa yrityksen toimintaa. Finanssikeskeisesti toimiva sijoittaja osoittaa näkemyksensä myymällä osakkeensa. Joskus vaikutus yrityksen päätöksentekoon voi olla epäsuora - epäilys siitä, mitä liikkeitä tietyt toimenpiteet aiheuttavat markkinoilla, vaikuttaa yrityksen valintoihin. Sijoittajasuhdetoiminnan avulla yrityksen hallitus ja johto voivat ohjata omistajia ymmärtämään, mihin suuntaan yritystä kehitetään. Yritys voi myös vahvistaa tunnettuuttaan ja kiinnostavuuttaan sijoituskohteena sellaisten sijoittajien piirissä, joille yrityksen tulevaisuuden strateginen kehitysvaihe sopii. Kun yritys kohdistaa lisäksi sijoittajasuhteiden uusasiakashankinnan useille maantieteellisille markkinoille, sen osakkeiden osto- tai myyntitoimeksiannoille löytyy helpommin vastakaikua markkinoilta eri aikoina. Amerikkalaisten sijoittajien kiinnostus osaketta kohtaan voi vahvistua eri aikaan kuin eurooppalaisten tai japanilaisten sijoittajien kiinnostus. Siksi esimerkiksi Nokian kaltaiselle globaalisti omistetulle yritykselle omistuksen jakaantuminen laajalle sekä maantieteellisen että sijoittajaprofiilin mukaan vahvistaa osakkeen sijoitusmarkkinoiden toimivuutta. Lähde: Kariola, Angervuo ja Niemelä (2004) Yritys sijoittajamarkkinoilla. Luin jokin aika sitten Helsingin kauppakorkeakoulun yrittäjyyden professorin Arto Lahden teoksen Strateginen yritysanalyysi. Teos on vuodelta 1988 eli ei ihan tätä päivää, mutta nimi oli niin osuva, että vanhasta vuosikerrasta huolimatta päätin kahlata sen läpi. Ei ollut hukkaan heitettyä aikaa. Jos vertaa Lahden kirjaa tuoreempiin vastaaviin teoksiin voi todeta, että peruselementit ovat säilyneet lähes muuttumattomina. Merkittävin kehitys kahdessa vuosikymmenessä on tapahtunut aineettoman pääoman analyysissa sekä immateriaalipääoman että osaamispääoman osalta. Tämä selittyy luonnollisesti talouden rakenteen muuttumisella teollisesta yhteiskunnasta kohti tietointensiivisempää palveluyhteiskuntaa. Lahden kirja on siis yhä relevantti luettavaksi, jos jostain sen vielä onnistuu käsiinsä löytämään. Lahti jakaa yritysanalyysin karkeasti kahten osaan, ympäristöanalyysiin ja voimavara-analyysiin. Yrityksen ympäristöä koskevan analyysin tarkoituksena on tunnistaa näköpiirissä olevien muutosten vaikutukset yrityksen toimintaan. Sillä on kaksi tärkeää tehtävää: ensinnäkin sen tulee kertoa organisaation tämänhetkisestä strategisesta asemasta. Toiseksi sen tulee kertoa niistä tulevaisuuteen liittyvistä kehitystrendeistä, jotka mahdollistavat tai uhkaavat organisaation taloudellisten pyrkimysten toteutumisen. Voimavara-analyysin tehtävänä on Lahden mukaan selvittää, miten hyvin yrityksen hallussa olevat voimavarat sopivat sen taloudellisten pyrkimysten toteuttamiseen. Miten markkinat on määritelty? Kuinka suuret ne ovat? Mikä on markkinasegmenttien koko ja kasvunopeus? Mitkä ovat segmenttien tarpeet ja ominaisuudet? Miten segmenttien tarpeet ja ominaisuudet muuttuvat ajan suhteen? Toimialan katsotaan muodostuvan niiden yritysten joukosta, jotka myyvät samanlaisia tuotteita tai palveluita yhteiselle asiakaskunnalle, ostavat tuotannontekijänsä samalta hankkijaryhmältä, saavat rahoituksensa yhtenäiseltä rahoittajajoukolta ja hallitsevat yleisen tiedon ja taidon, jota nimitetään teknologiaksi ja joka on alan yritysten kilpailullinen perusta. Teorian mukaan toimialan kilpailu on sitä kovempaa, mitä avoimempi toimiala on kilpailulle. Toisaalta mitä korkeampi on neljän suurimman yrityksen (markkinajohtajien) osuus toimialan myynnistä, sitä paremmat mahdollisuudet näillä on säädellä toimialan markkinoiden hintatasoa. Keskittyneille aloille on tyypillistä, että markkinoita hallitsevat suuret yritykset joutuvat sijoittamaan voimakkaasti markkinointikustannuksiin pitääkseen toimialan suljettuna. Mitkä ovat toimialan taloudelliset ominaispiirteet ja miten kilpailu vaikuttaa niihin? Mikä on toimialan jakelujärjestelmän rakenne? Millainen on toimialan kommunikaatiojärjestelmän rakenne? Millainen on toimialan tuotantojärjestelmän rakenne? Millainen toimiala on taloudellisena järjestelmänä? Miten taloudellinen valta jakaantuu toimialan eri osatoimialoilla ja tuotantovaiheissa? Miten edellä mainitut tekijät muuttuvat ajan myötä? Tähdet ovat liiketoimintoja, joilla on suuri markkinaosuus kasvavilla markkinoilla. Näihin kannattaa investoida. Lypsylehmät ovat liiketoimintoja, joilla on suuri markkinaosuus kypsillä, hitaasti kasvavilla markkinoilla. Kassavirtakyky on vahva ja investoinnit pienet. Kysymysmerkit ovat liiketoimintoja, joiden markkinoiden kasvunopeus on suuri ja markkinaosuus pieni. Investointitarve ylittää kassavirran, joten mukana olo vaatisi paljon rahoitusta. Koirat ovat tuote- tai markkina-alueita, joiden markkinaosuus on pieni hitaasti kasvavilla markkinoilla. Kassavirta on pieni ja markkinaosuuden kasvattaminen ei houkuttele. Ulkoinen tehokkuus, sisäinen tehokkuus ja elinkelpoisuus ovat yrityksen kolme keskeisintä tulosaluetta. Mitä epävakaampi ala, sitä enemmän tulee painottaa joustavuutta ja mitä vakaampi ala, sitä tärkeämpää on kannattavuus. Konsernitasolla yritysjohdon tulee vastata kysymykseen, missä liiketoiminnassa yritys on mukana. Liiketoimintatasolla johdon tulee vastata kysymykseen, miten kilpailla tietyssä liiketoiminnassa. Hajba (1978) on havainnut, että yrityksen kasvupyrkimys on keskeisesti riippuvainen yritysjohdon ja omistajien määrästä. Pienet omistajakeskeiset yritykset pyrkivät laajentumaan aktiivisesti ja voimakkaasti, kun taas suuret laajapohjaisesti omistetut ja monimutkaisen yritysrakenteen omaavat yritykset laajentuvat hyvin varovasti. Tämän mukaan ekspansiivisen kasvun keskeinen käynnissäpitävä voima on yrittäjyys. Hyvin kannattavat yritykset diversifioituvat lähialoille ja heikosti kannattavat uusille aloille. Sisäinen tehokkuus on korkea silloin, kun yritys kykenee toteuttamaan korkeaa asiakaspalvelutasoa alhaisilla kustannuksilla. Ulkoisen tehokkuuden kaksi oleellista indikaattoria ovat markkinaosuus ja kasvu.